Kelsey Grammer stars in Animal Farm, a political drama. Over all the film is kind of fun with all the talking animals and their quest for freedom. 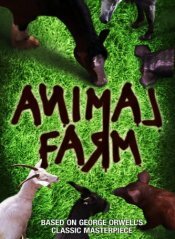 Based on the novel by George Orwell, the farm animals simply start to get weary of their owner and plot and organize a plan to set themselves from from his rule. The allegorical drama uses democracy and the real life experiences of peoples around the world in that yearning quest. The Political Position of this Film Depends on You! Of course, this film can be interpreted in the opposite way as well. The causes for the rebellion are obvious, the animals start paying attention at how they get treated, some of them are mercilessly killed, etc. A part of the film actually makes the point that for thousands of years animals have been at the service of men in so many ways, including labor and food. But no more, no more will animals allow humans (their sworn enemy!) to rule them. With all the so called "sensitivity" for animals out there, especially in schools, the film will just give your children the impression that humans are evil and should not "rule" animals, much less hurt them in any way.. The Bible's position on this is very clear, God gave Man dominion over animals, plants, fish, and everything else that creeps upon the earth. Could it be that for the sake of democracy film makers here are attacking that very Judeo Christian principle?